When you hear the term, “fanny pack,” you try not to giggle as you imagine those waist storage travel packs popular with tourists decades ago. Fortunately, for hunters, the fanny pack is a lifesaver. Specifically engineered to carry all of your gear, hunting fanny packs keep your survival gear, your knives, and everything in between organized within reach. That keeps your hands free for more important things, like aiming your weapon or making sure that stray branch doesn’t scratch your face. Why is a Fanny Pack Handy While Hunting? There are many reasons you want to have a good fanny pack with you on your next hunting trip. Whether you are just out for the day or you are going on an extended hunting trip, several designs are available for your needs. Fanny packs are specifically engineered for hunters of every skill level. 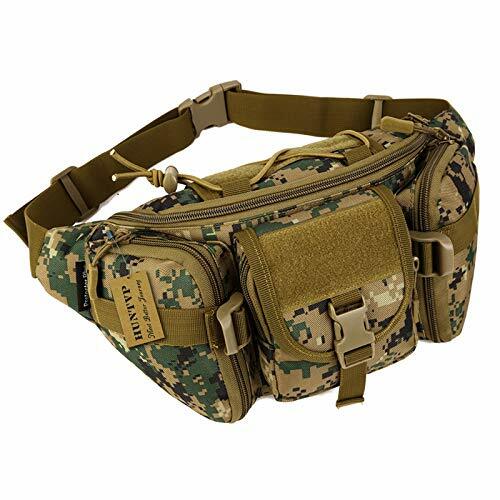 Unlike generic fanny packs – that usually only have one or two pockets – hunting fanny packs are made for the materials you use on every hunting trip. They are made of durable materials (such as canvas and nylon), with strong stitching and zippers for long-term wear. Do you know how long people have been using fanny packs? It’s longer than you think. The fanny pack dates back to the prehistoric period, where people would attach bags made of leather hides to their belts for carrying small items. They were especially popular in the 1980s and 1990s as a replacement for a purse or backpack. They are currently making a comeback, with designer models available by Gucci and Louis Vuitton. There are several types of fanny packs, including models built for hunters and fitness enthusiasts. They easily store the items you reach for often. When you pack for your hunting trip, there’s a difference between the things you need and the items you might need. With a combination of smaller and larger pockets, you can store everything from your navigational aids and extra ammunition to ponchos and safety gear. With a hunting fanny pack, you’ll always be prepared. Fanny packs are designed to keep all of your materials secure as you walk. In any other go-bag, your possessions will get thrown around inside as you move. With a hunting fanny pack, the compartments are packed securely. The more sensitive items inside – such as your compass – won’t get knocked around as you walk and trek through uneven terrain. 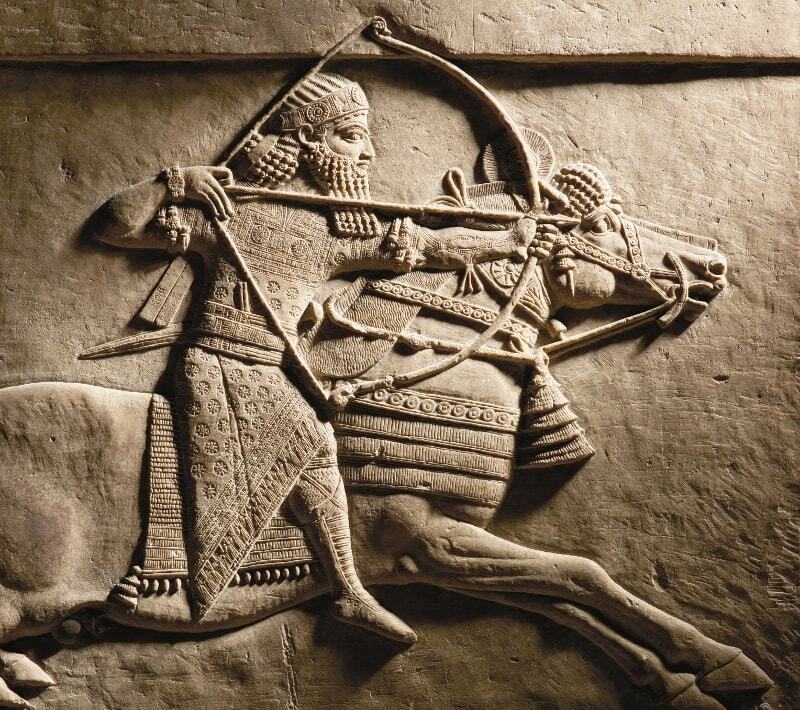 If you are hunting, you’ll need proof that you are authorized to do so. You should always carry your hunting license and your photo ID with you. If your hunting fanny pack isn’t waterproof, you want to protect these documents with a waterproof document protector or pouch. You can find some here. If you get lost during your hunting trip, it doesn’t have to be a disaster. Almost every hunting fanny pack has a small pouch for a compass. You can keep a map with your important documents to help you find your way to camp or the nearest landmark. You should always carry a flashlight, in case you get lost at night; always pack extra batteries. Flashlights are also useful for activating the phosphorescent paint on most compasses. Getting hurt during a hunting trip is pretty inevitable. You should always have some first aid supplies with you. Some items to include in your hunting fanny pack would be sterile bandages, antibiotic cream, insect repellent, baby aspirin, tweezers, allergy treatment, tape, and gauze. You might also want to include items to treat a snake bite if hunting in an area where this could be a hazard. Before packing these items, you should always know how to use them and what to do if an emergency arises. Of course, you’ll want to bring your essential tools for hunting. 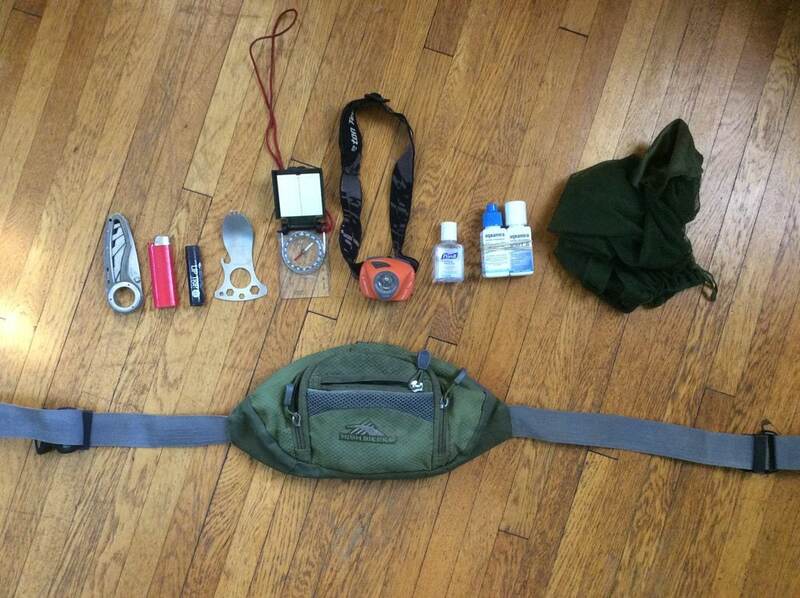 Your hunting fanny pack will include room for extra ammunition, your hunting knife, a sharpening stone, and flagging tape. Since every hunter is different, you can use your hunting fanny pack to bring your own items tailored to your specific needs. What Makes a Great Hunting Fanny Pack? When you are shopping for a hunting fanny pack, what do you look for? Is bigger better? Or should you find a model with more pockets? It depends on the hunter and the hunting trip, but there are some qualities that every hunting fanny pack has that will benefit any hunter. The material of your hunting fanny pack should be lightweight yet durable. The best options for your purchase will be either canvas or nylon. This will keep your items safe and hold up to the elements. Canvas and nylon packs are also quiet, this is a valuable quality when you are hunting. The smallest noise will alert the target of your position, so having a bag that stays quiet during movement is essential to taking down your mark. This also ties in with the material of your pack, but is your hunting fanny pack waterproof or water-resistant? Water-resistant packs will hold up against a light drizzle, humidity, or the spill of a water bottle. It won’t protect against any more moisture than that, putting your contents at risk. Waterproof packs are better for rainy days or extremely wet conditions. It’s always better to get a waterproof bag to make sure your items stay dry, even if you aren’t sure about weather conditions. What’s the Difference Between a Fanny Pack and a Day Pack? Several fanny packs come with the option to expand into a day pack. Day packs are very similar to backpacks. The fanny pack only fits around your waist, while you wear the day pack on your back. If you have a fanny pack, then you wear them towards the front of your body. This makes it easier to reach what you need. You wear day packs on your back, so it isn’t as easy to reach the storage compartments. However, they have more room for storing survival and camping gear. The point of a good hunting fanny pack is having enough storage pockets to keep all of your items safe during your trip. But, do you have enough room to hold everything you want to bring with you? Are you taking a day trip, or are you and your buddies going on an extended hunt? 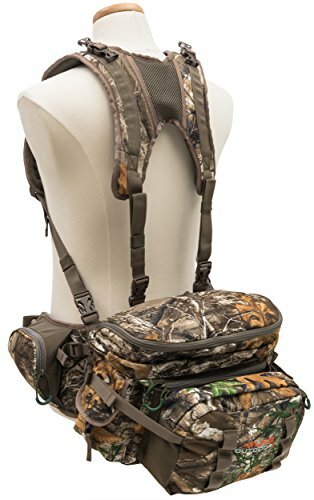 Keep in mind what you will need for your hunting trip when looking for the best fanny pack. Many models extend from fanny packs to day packs for bringing camping gear. Others are compatible with extra storage options. Also, are the storage compartments easily accessible so that you can grab what you need when you need it? Since you’ll be carrying a good amount of materials with you, your hunting fanny pack should evenly distribute the weight. The best fanny packs will have adjustable shoulder and waist straps so that you can wear them comfortably. The adjustability also works well to give you the best fit. If your weight fluctuates, then this quality is helpful. You don’t have to reinvest in another pack. You can just change the tightness of the straps. We’ve reviewed the best hunting fanny packs on the market this year. When we were making our selections, we looked at the best-rated items. We also considered other features, such as how well they adapt to your needs and the durability of the materials. Extremely Lightweight: Only Weighs 1.6 lbs! The ALPS OutdoorZ Little Bear is one of the top-rated fanny packs for hunters. 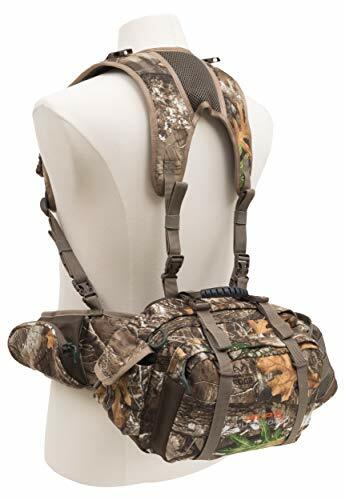 This extremely lightweight hunting fanny pack has multiple pockets of different sizes so you can carry your large and small items on your next hunting trip. Great for either hunting or hiking, this fanny pack has six compartments within arm’s reach. Hunters love the Little Bear because of its camouflage design and its compatibility with other ALPS attachments. You can add extra pockets, such as the binocular or turkey call pocket compartment, to the Little Bear without weighing it down. The main pocket is perfect for storing your larger items, and the smaller compartments along the belt and the sides are great for your smaller pieces. Both the shoulder and waist harnesses are removable, so you can wear the Little Bear however you feel the most comfortable. 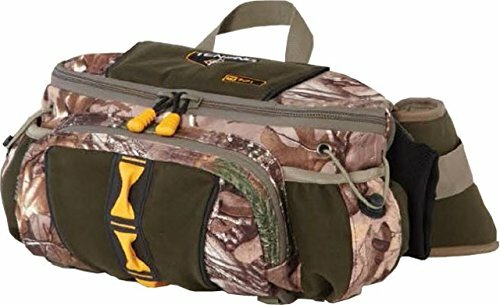 Although not as big as some of its competitors, the ALPS OutdoorZ Little Bear Hunting Fanny Pack is perfect for the hunter who travels light. Although we like the ALPS OutdoorZ Little Bear Hunting Fanny Pack for its compact design, it isn’t practical for any long-term hunting trip. The pockets are too small to pack anything other than what you need for the day. Getting into the compartments themselves can be tricky if you have large hands or you are wearing thicker gloves on a cold day. The removable harnesses are convenient and there have been no complaints on the Little Bear’s durability. It holds up well, but it isn’t waterproof. That might be a deal-breaker, but it’s a good fanny pack for a day out. If you are looking for a larger fanny pack than the Little Bear, then the ALPS OutdoorZ Big Bear is your perfect match. This fanny pack has the same pocket options – one main pocket with two on the side and one in the front. It also has two extra pockets on the waist like the Little Bear. What makes this model so amazing is that it expands into a day pack. The day pack hooks onto the removable shoulder straps so you can convert your fanny pack into the bag you need. It only weighs two lbs, five oz, but the Big Bear can hold up to 44 liters of items! When you aren’t using the day pack, it breaks down and stores in the fanny pack. Just like the Little Bear, the Big Bear is compatible with all ALPS extensions. Every hunting trip is different: sometimes you pack light, sometimes you don’t. The Big Bear adjusts its size so you can always bring everything you need. Just like its smaller counterpart, the ALPS OutdoorZ Big Bear has some design issues that might not suit every hunter. The main difference between the Big Bear and the Little Bear is that the Big Bear has an attachable day pack. The Big Bear won’t protect your items during a heavy rainstorm, and there have been some complaints that the straps don’t hold up. We do like how you can switch back and forth between day pack and fanny pack (depending on how much you are bringing on your hunting trip), and that convenience of not having to invest in two different packs is worth the investment. There are hunters, and then there are hunters. If you regularly rough it in the outdoors on your hunting trips, then the ALPS OutdoorZ Pathfinder will keep you prepared. A step up from the Big Bear, this water-resistant canvas combination fanny pack/day pack has more room for carrying larger items. With more straps to keep the Pathfinder securely attached to your body, it aligns your cargo with your center of gravity to evenly distribute what you are carrying. This makes it easier on your back and legs when walking and trekking long distances. The Pathfinder is adaptable for ALPS extensions as well as other packs so you can create your own go-bag for your hunting trip. It has space for a water bottle, with larger compartments for your jacket, blankets, and tent. The front of the day pack has an easy-access pocket that fits either a gun or a compound bow. No matter how you hunt, you can store your weapon. 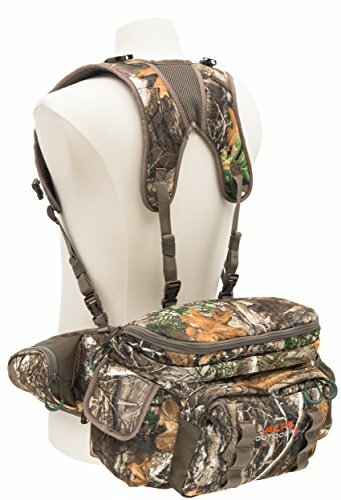 If hunting is more than a pastime, then you need a hunting fanny pack/day pack combination that can keep up with you. The ALPS OutdoorZ Pathfinder is entirely adaptable, with multiple compartments to store your small to large items. There is also a pocket for easy access to your weapon. The only downside we see to this product is the pouches aren’t well-organized. This can be troubling if you are trying to keep certain items away from each other – such as your compass from anything with metal in it. There have been some complaints that the pack wears out quickly, but these are relatively minor. Overall, we think the Pathfinder’s benefits outweigh the downsides. While the tactical waist pack is designed more for hiking, this model – just like the Little Bear – is also useful for hunters who travel light. The canvas exterior comes in several versions of camouflage, so you can purchase the one that matches your terrain the best. This hunting fanny pack is smaller than most others, so you can conveniently wear it over your shoulder, across your chest, or on your waist. If you do choose to wear it on your waist, the adjustable buckle goes up to 51.1”. The Huntvp weighs less than a pound, so you won’t be weighed down by anything more than what you are carrying inside of it. ABS buckles secure the front pockets, so your items are always safe. Unlike many other hunting fanny packs, the interior of the compartments is lined with cotton. This makes it easier to transport more delicate items. There is even an elastic bungee cord on top of the pack that can hold a long, flat item (like a GPS). If you are just going out for the day, and all you need is your weapon, some extra ammo, and some basic supplies, then the Huntvp is all you need. The Huntvp Tactical Waist Pack is perfect for the casual hunter who doesn’t like to be loaded down with a heavier pack. However, it isn’t an ideal fanny pack. It isn’t waterproof, so it won’t protect your items during extremely wet conditions. Plus, it is a lot smaller than it looks. It won’t hold much. If you have more than will fit in your pockets – but not enough to need a traditional hunting fanny pack – this would work well for you. While we all love hunting, sometimes the cold climate can ruin our fun. The Tenzing TZ 721 Hunting Waist Pack was designed specifically for hunters who live in colder climates. It comes with 17 storage compartments – including one for a cell phone – that holds 727 in3 of supplies! The Tenzing weighs only two lbs, so it's not extra bulky or heavy. This fanny pack has an extra flexible waist, with an adjustable belt that goes up to 56”. The real winner of the Tenzing is the spaces for warming packs. This fanny pack has a built-in hand warmer (with space for a warming pouch), as well as three more warming areas around your back and torso. Keeping your hands warm is crucial when you are hunting, as it keeps the muscles and tendons in your fingers flexible, so your hands won’t lock up when you’re trying to make that shot. For extra comfort, the Tenzing has a soft mesh material that pulls moisture and sweat away from your back to keep your skin dry and warm. When you hunt in a colder climate, you need the extra protection of staying warm while you are out in the woods. The Tenzing TZ 721 Hunting Waist Pack focuses on keeping your hands and the center of your body warm so you can concentrate on the hunt. As amazing as that is, the pack itself isn’t perfect. The color isn’t the best camouflage, so it might give away your location. Also, this thing is loud. The Velcro straps and zippers aren’t the quietest, so it makes using it for hunting pretty pointless. However, we give the product credit where it is due: it does keep you warm. When you are out hunting, you need to stay focused on the task at hand. The last thing you need is to go digging through your pack to find what you need. Staying organized is the best way to stay focused on the hunt. When you have the right hunting fanny pack, you can keep all of your necessary items organized, safe from the elements, and right where you need them.